Albedo is the Overseer of the Floor Guardians of the Great Tomb of Nazarick. She is in charge of the general management and supervises the activities of the seven Floor Guardians, meaning that she ranks above all the other NPCs in Nazarick. She is the sister of Nigredo and Spinel. She was created by Tabula Smaragdina. An impeccable beauty, Albedo is a woman with lustrous jet-black hair and the face of a goddess. She has golden irises and vertically split pupils; on her left and right temples are two thick horns protruding crookedly, and on her waist is a pair of black angel wings. Like Shalltear, Albedo has a true form as a heteromorphic race NPC. Shalltear called her a "big mouthed gorilla" when they quarreled, so her true form may be quite large in size. Extremely loyal and extremely in love, Albedo is completely infatuated with Momonga, often showing obsessive tendencies when it comes to his affairs. She is always vying for Momonga's affection, showcasing outbursts of jealousy whenever anyone else appears to be getting close to him. This is because the last thing Momonga did in Yggdrasil was to use his administrative privileges to edit her character history, adding the she is "madly in love" with him. Among all the Guardians, Albedo is the most vocal when it comes to expressing opinions. She will openly denounce any statement or action deemed inappropriate, reaching the point where Momonga sometimes considers it an annoyance. As the Overseer of the Floor Guardians, she is very levelheaded. Albedo can make calm and collected judgments that Ainz, sometimes, doesn't think of. She takes Ainz's orders as top priority and absolute, punishing anyone, even a Floor Guardian, who'd dare belittle his orders. Like many others in Nazarick, she absolutely loathes humans and views them as an inferior species. 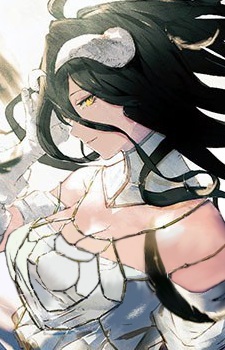 In the web novel version, Albedo does not exist. Though the reason is not yet known, Albedo holds a strong hatred towards all of the 41 Supreme Beings except for Ainz. It is hinted that she is scheming to annihilate all the other guild members if they are found.